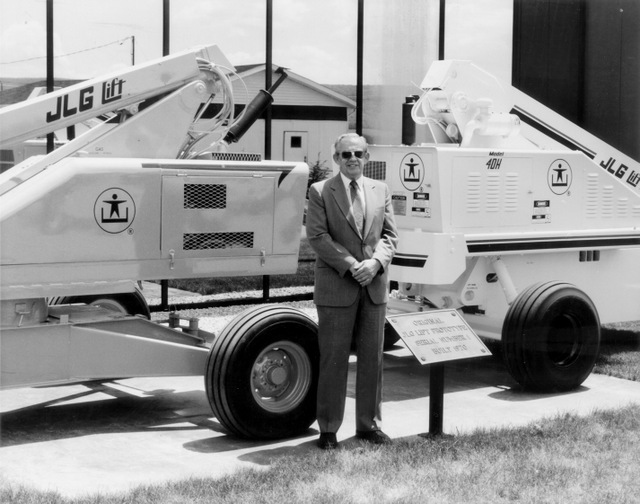 John L. Grove, founder of JLG Industries Inc., an Oshkosh Corporation company and a leading global manufacturer of aerial work platforms and telehandlers, was recently honored posthumously with the prestigious Lifetime Achievement Award from the International Powered Access Federation (IPAF) and Access International at the annual International Awards for Powered Access (IAPA) conference. The IAPA lifetime achievement award is presented annually to an individual who made significant and lasting contributions to the powered access industry or played a key role in the industry during the course of a career or over many years. Grove’s contributions to access date back to January 9, 1969, when he rallied a small group of people around one big idea — to create a safer way to work at height. This seed idea came to life with the introduction of the first aerial work platform, commonly referred to as JLG 1. Grove’s passion for safety and his pioneering spirit continues to be carried out today by more than 6,000 JLG employees around the world. Since the introduction of the first boom lift, the company has claimed many access industry firsts — including oscillating axles for boom and scissor lifts in 1981, the only fuel-cell powered boom lift in 1999, the first environmentally-friendly 60-foot electric boom lift in 2000 and the first straight boom lift to reach 150 feet in 2011. The company surpassed its own record in 2014 with the introduction of a 185-foot model 1850SJ, the world’s tallest self-propelled boom lift. In the same year, JLG introduced the first true hybrid diesel/electric boom lift, the H340AJ. To learn more about the 50-year history of JLG, visit www.jlg.com/en/destination/jlg50. For more info about JLG, click this link. It’s super clickable. Honest.